Welcome to the haunted hovels section of haunted places in Maine. Please select a link below to view information on that location. This section on Haunted places in Maine is always growing and locations will be added when time permits, so check back if you don't find what your looking for. Alternatively, if you know of a haunted location that isn't in the list, then feel free to submit one by clicking the above link. 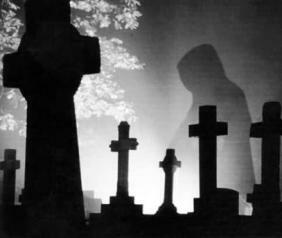 The Haunted hovel aims to have the most complete list of haunted locations on the web, so stay tuned, it'll be worth it. The first European settlement in Maine was in 1604 by a French party and there are many french influences within this state. As with all states classic tales of Indian hauntings are common here, as well as some civil war ghosts. Some ghost stories from this state are about the Pop-ham Colony which did not survive the harsh Maine winters and the whole Roanoke Colony was lost. orbs showing up in pictures, something banging on the side of witnesses cars and footsteps in the grass. Two years ago there was a fight at this school. A kid was about to punch the other kid and fell and broke his neck. There was reported sightings of large objects being moved around, cold breezes in specific areas on hot days, and kids being shoved and pushed by an invisible force. People also say they have seen the kid. He is a dark shadowy figure with none of his features visible. In the 1800's a woman was practicing witch craft. The towns people decide to hang her. After her death they buried her in a cemetery near a big stump. The legend goes that if a star mysteriously appears it means that the witch is roaming the pit. One theater technician reported feeling cold and seeing a swinging lamp in a room with no outside ventilation, it was the scenery construction shop at the top of the theater. Up and down river road there are 5 markers made out of stone. It is said that thousands of years ago Native Americans lived on this site. There have been many many surveyors that have looked over the stones and nobody knows what they are or what they were used for. that late at night on full moons strange things happen near those stones. you can hear old voices and singing. The grave of Jonathon Buck has a footprint cracked into the tombstone. The tombstone has been replaced many times but the foot always reappears a short time later. Jonathon Buck ordered the death of his mistress, claiming she was a witch. She promised to return and dance on his grave. It is believed to be her foot (and leg) that continues to appear on the tombstone. According to legend back in the 1950's 5 young high school boys were murdered mysteriously at the school and no one knows who did it. Ever since, late at night when you’re walking the track behind the school you'll see glimpses of lights going on and off and hear strange noises if your near the school, even feel like your being watched. On the side of the new Dudley oxford road, for about a mile there is the remains of the first road. At night many reported a mysterious man in an old colonial black alphet riding down the road on a horse. No one has been to close to really make out the man, but many reports from people walking by. Some people say that the YMCA was built on an ancient Indian burial ground, but no one knows the real truth. Sometimes the janitors on night duty see a small female-like figure walking around the pool. Nobody knows who or what it is, or what it wants. Things such as cold spots, footsteps, and objects being moved around happen occasionally, and more frequently in certain rooms than others. The most common things are stereos and TV's being turned on and off, clocks being reset right before students' eyes, and general harmless pranks like these. Supposedly there was a shipwreck here and the captain of the ship was decapitated. It's the typical story of the headless ghost wandering around, supposedly searching for his head. Reports of doors slamming, people running up and down the old staircase, apparitions of soldiers walking on the rafters in the barn and cold spots. This cottage was once an old school house. Late at night (12:00 to 1:00) you can hear children screaming and running in and out of the rooms. When these children run in the moonlight they become visible to the human eye. Their have been sightings of lights in the shape of a human figure. Brooms, and janitorial objects have been seen moving on their own. People have said that a janitor died in front of the stage area. No one knows for sure what the weird sightings are though. The White Lady can often be seen walking alongside the road and the green bridge. Back in the 1940's a young couple was traveling into town, back from their honeymoon. The car went off the side of the road into a ditch and the man told his wife to stay by the car while he walked into town for help. When he came back, his wife was nowhere to be seen and now her ghost haunts the road and any passenger who travels it. Certain places will have thick pockets of fog and several townies have had spooky encounters with this young lady, who they have dubbed, "The White Lady." Her car is still located on the side of the road, down in the ditch, on its roof, untouched. The Poland Spring Inn is haunted by the first owner, the famous Hiram Ricker (founder of the Poland Spring water company). Several employees have seen the ghost of Hiram wandering the Inn. Some workers report hearing the voice of Hiram coming from vacant rooms, and his footsteps can be heard in the early hours of the morning in the empty lobby. He has also been known to play tricks on the staff by moving various objects to unusual places. This is a bed and breakfast place right now, a man hung himself there a LONG Time ago, and then his wife died a few days later and their kids were left to raise themselves...the man hung himself in the middle window on the top floor, He still haunts it. The shades in other rooms pull themselves down, and sometimes u can even see him there.......Its a Very "Evil" Place...go see for yourself. Cold chills will run down your spine over and over. There is a child that haunts the old chapel, he was the son of the family that owned the land before the college was erected, he was buried in the chapel and had to be moved, sometimes you can hear him laughing and playing. There is a small girl that haunts the pond. She drowned while playing near her little play house, her father built her. Correction officers have seen spirits of inmates in the industries building. Most of the equipment came from the old prison in Thomaston, which had a lot of spirits. A lot of ghost stories have been reported there before it was torn down. People feel very uneasy in the industries building at night. Feel like there is someone there even though you are alone. In the early morning hours sometimes the locals claim to see two young girls playing in front of the old chute road cemetery. Legend has it that there are two sisters who have tombstones there but are not buried there because their bodies were never found. They believe the girls might have died in an old well or mine shaft. This particular road is supposedly extremely haunted. Local legend states that this was the road that they made the people who were accused of being witches walk up and the same place where they were hung. the validity behind this legend is not known but it is a -very- scary place to be. Way back in the Colonial days, this building used to be the town hall for the village of York. The story goes that the village head had a young woman hung from the front of the building, accused of witchcraft. Doors open on there own, moving items, and cold breezes can be felt. Sometimes, locals (who have named her "The White Witch") will see a woman walking around the outside of the building/along the road late at night. Across the street from the museum, there is a day care center. Some children at the center have told people that a "very nice lady in white" sometimes comes over and plays with them during there recess. A nice place to visit, the spirit does not harm anyone.